ENERGY, ENERGIZE, ENLIGHTEN, STEP UP, TRANSFORM, ASCEND… THE WHY. Everyone is talking about it and the more I look around, the more articles I see discussing the ramping up of the energies. The energy and the manifestations it is creating are a result of different things depending upon which article you read, but the consensus is that Earth is being bombarded with energy that is pushing consciousness into a higher level of awakening and transformation. I think everyone awake enough to be reading these articles (mine and everyone else’s) can feel that something is making this point in their life different than what they previously considered ‘normal’. So what are you feeling and why is it happening? The first thing to understand is that what is happening is not new and that the knowledge of what is occurring has existed on Earth for millennia. Our current physical reality exists within a narrow window of frequency and wavelength. Everything that we think is so solid and immutable is nothing more than solidified consciousness vibrating within a spectrum. Think of the radio dial on an old FM radio; you turned the dial and as the frequency rose you found another station to listen to. More than one station existed on the radio and you tuned into the one that was playing what you wanted to listen to. Well guess what? You can do that with consciousness too and we are in the process of deciding which station we want to listen to. A new station on the “Earth Consciousness” radio has been created and the energy that everyone is talking about is the etheric hand attempting to turn the dial in your head so you can tune into the higher frequency… if you are ready, and only if you want to. Earth has leylines and energy grid points that lock each construct into a spatial relationship. When a new construct deflects from an existing one, these grid points are used to keep the new at the same relationship to the old. Once the deflection is completed both constructs will then evolve independently, but the grid lines keep it all in synch until the shift is complete. There is talk about a “New Earth” or that the Earth is ‘splitting’ and these concepts are attempting to convey the new construct the best they can. Consider the picture that accompanies this post. 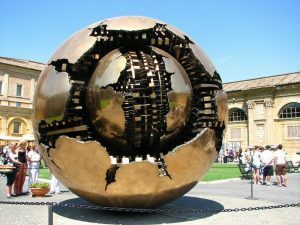 This is a sculpture that is on display at the Vatican and other prominent locations around the world. Regardless of what the sculptor intended, for whatever reason it captivates people enough that several of them have been created. Art by definition is; “The creativity of others observed through personal interpretation”. I would therefore like to share my personal thoughts on this work as it relates to this post. Looking at the spheres you can see that there are two, one within the other. From the perspective of this post the sphere in the center represents the Earth construct that we currently exist within. We then see that another Earth construct exists surrounding the original with a gap between the two. The second and larger construct meant to signify the higher frequency of it in relation to the original. The gearing and block structures that protrude from the cracks convey the meshed nature of the two and that one follows the other. This meshed structure further shows that our reality is consciousness solidified within a geometric frequency grid. As I previously posted, since last week I feel like I am standing between the two and it is becoming increasingly difficult to hold my energy down and continue to operate here. I am beginning to understand the transition and will offer my experiences as soon as I can make sense of them in a linear fashion. I really wish my book was available because we would then have a firm foundation to work from. I’m going to get this posted and then follow up with some simple techniques I am using to get myself firmly established in the new construct.